West Bromwich Albion have signed Tottenham midfielder Alex Pritchard on loan until the end of the season. The 22-year-old can go straight into the Baggies squad for Tuesday's Premier League game at home to Swansea City. A product of Spurs' academy, he made his first-team debut in 2014 after loan spells at Peterborough and Swindon. 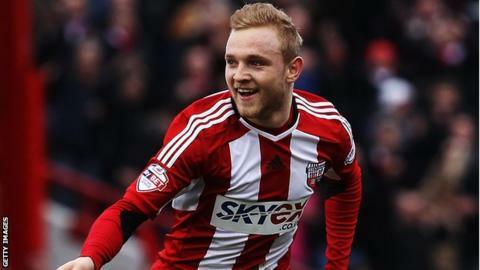 Pritchard, who spent last season on loan at Brentford, where he scored 12 goals in 47 games, has played just once for Spurs this season. The England Under-21 international signed a new four-year deal with Tottenham last summer. "It's been a hectic few hours - I was close to going elsewhere," he said. "But when this came about I didn't hesitate to come here." "West Bromwich Albion indicated that they had no intention of changing their stance on selling Saido Berahino in advance of deadline day, and were true to their word, despite endless hyping of the possibility from outside. "However much money Newcastle did offer, it wasn't enough to tempt chairman Jeremy Peace to sell, and that in turn made it much less likely Albion would expand their squad. "The one deadline day signing day they did make was talented young midfielder Alex Pritchard, on loan from Tottenham Hotspur."